Rejoice!, Butler University’s holiday concert featuring the University’s choirs and the Butler Symphony Orchestra, returns to Clowes Memorial Hall for two performances, December 9 and 10, at 7:30 PM both days. Eric Stark conducting Butler’s annual Rejoice! 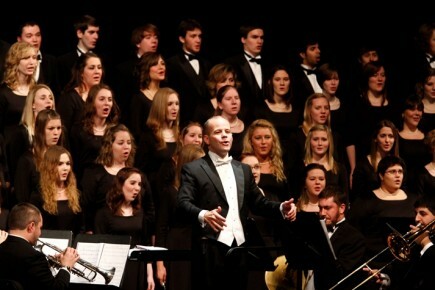 concerts, which this year will take place on December 9 and 10 in Clowes Memorial Hall. Tickets are $10. They are now available at the Clowes Hall box office, 317-940-6444. This year’s performance will feature the Butler Chorale under the director of Butler Director of Choral Activities Eric Stark, University Choir and Spectra (formerly the Women’s Chorus) conducted by Assistant Professor of Music John Perkins, and the Butler Chamber Singers conducted by Adjunct Professor of Music Pat Wiehe performing holiday favorites accompanied by the orchestra. The program will include “Fantasia on Christmas Carols” by Ralph Vaughn Williams, the first movement of the Gloria by John Rutter, music by John Williams from the film Home Alone, and some excerpts from the Messiah. The choir and string orchestra from Shortridge International Baccalaureate High School have been invited to perform.